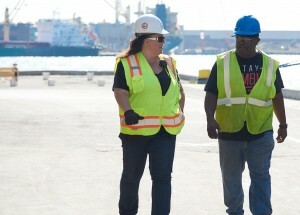 PhilaPort has always been committed to diversity in the awarding of contracts. It’s very important to us that minority-owned, women-owned and other historically underutilized businesses have a fair seat at the table. We’re currently developing a comprehensive diversity outreach program to intensify our commitment. We want to expand the array of major contractors PhilaPort engages, and we want our major contractors to be aware of the vast network of subcontractors at their disposal. PhilaPort’s Diversity Program has been recognized by the Philadelphia City Council for being the first in Philadelphia to include the LGBT category in its diversity program. These businesses are certified by the National Gay and Lesbian Chamber of Commerce (NGLCC). Check this area of our website on a regular basis for updates on our outreach program. It is our to promote opportunities for full participation by Minority-owned, Women-owned, Veteran-owned or Service-Disabled-Veteran-owned and LGBT-owned small businesses, hereafter collectively referred to as disadvantaged business enterprises (“DBEs”) in all project-related construction contracts to the greatest extent feasible and to do so by insuring that all Prime Contractors do not discriminate in the solicitation, award and administration of construction subcontracts on PhilaPort’s projects. PhilaPort will accept all diversity certifications which are accepted by the PA Department of General Services provided they fit into the following pool of inclusion; Minority, Women, Veteran, Service-Disabled Veteran, and LGBT. Are you a vendor certified in the following categories? Email procurement@philaport.com to get on our vendor list today! Q. Can certification as a Prime contractor count towards diversity participation? A. A Prime contractor’s certification cannot count towards diversity inclusion, please see link below outlining the requirements of our diversity inclusion plan. See page 6 of our Diversity Inclusion Plan (Construction) for more information. Q. What happens if the bidder cannot meet the requirements for Minimum Levels of Participation (MPL’s)? Q. What is the process of gaining certification as a diverse business enterprise and what certifications are required to be considered a suitable DBE that meets the standards of the PhilaPort policy? Q. Where can I find a list of certified subcontractors that fit the required designations? A. *Coming Soon. * Our website is currently being updated. Thank you for your patience. Click to open toggles for more information on topics above. To learn more about PhilaPort’s Procurement opportunities, click here.